Today General Motors (GM) announced a restructuring that will cut 14,000 positions and the possibility of closing five auto manufacturing plants. Some headlines attributed the restructuring to an economy that may be slowing. However, when one reviews the data that comprise new sales of automobiles and light trucks, the exact opposite conclusion is drawn. 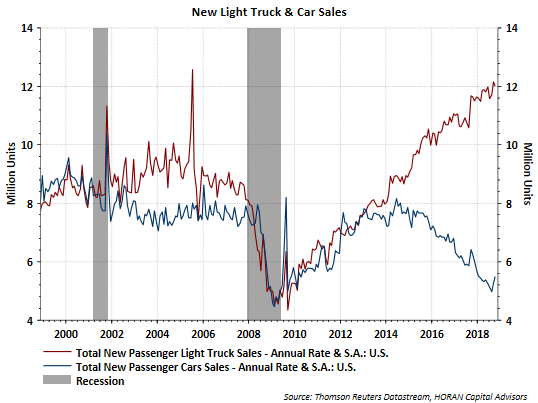 A divergence has developed in the sale of cars versus light trucks that is clearly evident when one looks at unit sales volume in the below chart. Since 2014 a noticeable turn in interest has occurred toward the light truck category and away from the automobile category. In other words, it appears GM is responding to market forces and focusing the future of the company on the light truck market. If anything consumers are paying up for vehicles in the light truck category, like minivans and SUVs. 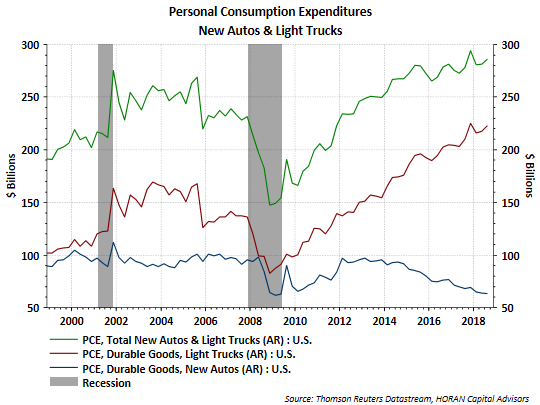 In terms of Personal Consumption Expenditures (PCE), the annual rate of the combined sales of new cars and light trucks is running at a pace that exceeds the peak reached in 2000 and 2007 as seen with the green line in the below chart. The maroon line represents personal consumption expenditures for light trucks (includes minivans and SUVs) and the blue line is the PCE for autos. Based on consumer spending habits, it appears they are showing confidence in their financial position and the economy by paying up for the more expensive SUVs/minivans versus the lower priced automobiles, some of which GM is now de-emphasizing.